The following is a list of seven general points to be aware of as the Ukraine / Crimea Crisis continues to develop. This resource has been constructed primarily for professors seeking to encourage classroom discussions on current events. 1. Crimea has had a History of Separatism. Some “myth busters” have argued that Crimea was always happily a part of Ukraine until recent Russian intervention, ignoring or brushing aside Crimea’s history of separatist movements. The Tatars once had their own. On the pro-Russia side, Crimea did leave the USSR as part of Ukraine. Immediately after, however, a political entity known as The Russia Bloc rose, eventually taking the majority in the Crimean Parliament. A representative of the Bloc, Yuriy Meshkov, was elected president of Crimea in 1994, running on a platform that focused on securing Crimean independence and asking for annexation to Russia. Yeltsin refused to support the movement and by 1997 it had largely died down, but it never completely went away, largely “mainstreaming” itself in its support for the Party of Regions, Ukraine’s most powerful political force focused on securing the rights of Russians and Russian speakers. The recent protests and political upheaval in Ukraine, however, helped reignite it. The pro-Russia separatist movement was important in moving the peninsula towards Russian annexation. A lack of such a strong separatist movement in Eastern Ukraine is one reason to believe that Russia will not make further advancements. 2. Annexation is Hard Work. As Crimea was preparing to secede from Ukraine and join Russia, lawmakers in Kiev scrambled to strengthen legal hurdles, bolstering their argument that the referendum was illegal. Crimea faces many other logistic and legal challenges as an unrecognized part of Russia. The real estate industry, banking and finance sectors, and infrastructure and social support are just a few of the major sectors that will need to be realigned. There are perhaps hundreds of other issues to consider – citizenship is a major one, but smaller details like traffic regulations and even questions over franchising rights, which are often granted by geographic area, must also be addressed. McDonald’s locations in Crimea, for instance, have closed as the franchisee for Russia is different from that for Ukraine. 3. Identity is Important, Complicated, and Sometimes Dangerous. According to Ukraine’s defense ministry, 50% of its troops stationed in Crimea defected to Russia rather than be evacuated by Ukraine. Indeed, recent research has shown that ethnic and political identities in Crimea are highly nuanced. Further, while Ukraine was long shown in the media as a harshly divided country, a closer look has revealed it to be diverse country, but not one that need tear itself apart. That said, both Ukrainian nationalists and pro-Russian activists have provided challenges to the new government in Kiev. Russia also faces possible resistance from Crimea’s Tatar population. Russia has promised measures in support of the Tatars, but fears remain. Ukraine has also promised to defend its minorities. It has also attempted to coopt militant nationalist structures that formed during the Maidan. One of Ukraine’s most aggressive nationalist leaders recently died after a confrontation with police. However, nationalists are still present in the government and active in society. This is a concern to Russians and Russian speakers. The implementation of measures to protect minorities and gain their trust will be of critical importance in maintaining civility and stability in Crimea and Ukraine. 4. More Russian Incursions are Possible but not Likely. Many news sources have reported that Russian troops are amassed at Ukraine’s Eastern borders. However, the numbers reported have differed wildly. Ukrainian defence officials have claimed there may be as many as 100,000. NATO was recently quoted as saying that there are 40,000. Ukraine’s deputy prime minister recently said 10,000-15,000. Meanwhile, investigative reporters from NBC actually traveled the border and found no signs of military build up. Military analysts, citing a long, open front, boggy spring time conditions, Ukrainian military capabilities, and likely citizen resistance in Ukraine, have suggested that Russia would need significant numbers, likely approaching 100,000 troops to make a serious military incursion. Russia has stated that its foreign policy will be focused on protecting Russian speakers abroad. This has sparked some concern about Russia’s intentions towards the Baltics and even Belarus and Kazakhstan. However, as Belarus and Kazakhstan are traditional allies of Russia, with fairly content Russia-speaking populations. The Baltics are members of NATO, against which an attack on one is considered an attack on all. Russia is not likely prepared for a full military confrontation with Ukraine, let alone NATO. Thus, neither scenario of violence is likely although tensions with NATO and the US are heightened. 5. Russians Support Crimea, Putin, and US Sanctions. A majority of Moscow residents told RFE/RL they supported Russia’s annexation of Crimea and also welcomed US and EU sanctions (as a way of reigning in corruption). Some 90% of Russians told a Russian polling agency that they support the annexation. Furthermore, a majority of Russians now see their country as a superpower and some 70% have a positive view of President Vladimir Putin. Most Americans, incidentally, see Russia as “unfriendly” while most Russians now have similar views of the US. However, Russians’ opinions of governments typically do not translate to opinions of individuals, meaning that anti-American sentiment is not necessarily sentiment against Americans. 6. The World Diplomatic Order is Tense and Changing. The US is working hard to isolate Russia. Russia has been ejected from the G8 and from cooperation with NATO. The US government is shutting down programs and talks on many fronts including military, civil nuclear energy and disarmament, and trade and investment. Even cooperation in space is being curtailed, despite having survived even the coldest days of the Cold War. US diplomats have argued that their efforts have been successful globally, pointing to a US-sponsored UN resolution upholding Ukraine’s territorial integrity, which passed with only 11 dissenting votes. However, most of Central Asia, many countries in the Caucasus, Africa, and South America, as well as every member of BRICS abstained from the vote. Russia still has many levers of international power including political, economic, and cultural. Although relations with the US, the world’s most powerful country, are a priority for most countries, many have chosen to balance relations between the rivaling US and Russia. Also, Russia, now under targeted sanctions, is working to improve ties with China and India, Asia in general, and many others. It is also working dramatically to insulate its economy from further sanctions. Thus, by pushing Russia away from its center of power, the US may succeed in helping to create the multipolar world that Russia seeks. One of the major reasons that sanctions against Russia have been so limited is because the US has limited trade with Russia and because the EU is highly economically integrated with Russia. The US is confined by what it can effectively impose on Russia and the EU is limited by what it can impose without significantly harming itself. The major economy to watch, however, is Ukraine’s. One reason why the situation has been of such importance to so many world powers is because Ukraine is a resource-rich breadbasket with some 45 million potential consumers on the edge of Europe. Despite its potential, Ukraine is facing critical economic challenges. Its credit rating is currently at “eminent default” or just above. Its treasury is empty, current account is negative, and it will have more than $10 billion in bond debt due to be paid this year. In addition, Russia’s energy giant Gazprom, citing $2.2 billion in unpaid gas deliveries, has cancelled Ukraine’s contract and is now charging “non-discounted” prices – at a rate of about 80% more than what Ukraine previously had trouble paying. State-controlled Gazprom is using another economic lever as well – asking for an additional $11 billion for discounts given based on rental agreements for the Sevastopol naval base. Russia now owns that base, Gazprom says, and thus Ukraine must repay the discount. Thus, most of the $13 billion that Ukraine expects in loans and aid this year will likely go towards debt and not towards the investment and reform that Ukraine also needs. Tight credit is hurting consumer confidence and spending in Ukraine. Perhaps even more significantly, it will hit one of Ukraine’s strongest economic sectors, agriculture, especially hard. As Crimea’s ports once processed most of Ukraine’s exports, export-intensive industries such as agriculture are expected to further suffer. Europe is trying to balance Russia’s economic pressure – negotiating for gas on Ukraine’s behalf and lowering tariffs in exchange for a signed Association Agreement. While this will help some Ukrainian exports, like steel and coal, the Association Agreement will likely flood Ukraine’s market with EU consumer goods, which will hurt Ukrainian finished goods manufacturers. Russia will probably raise trade barriers to prevent these goods from being re-exported to Russia, which will also raise a hurdle for Ukraine to a market that has traditionally accounted for about a quarter of its exports. Add to this the economic austerity demanded by IMF for the bailout given to Ukraine, Ukraine’s economy is expected to contract by at least 3% this year. 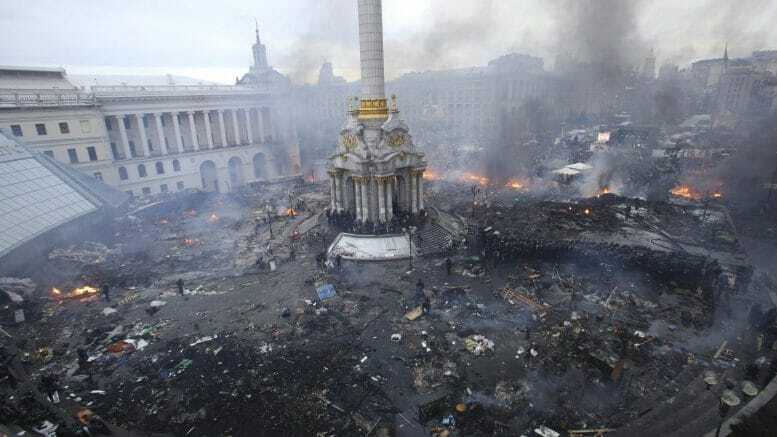 Ukraine’s Premier has called his government “kamikaze” as economic discontent will likely quickly sweep it from office. However, economic discontent was also one reason for the Maidan protests, meaning that the government could be swept from office even before the elections. Over the next few months, Ukraine will have to play a delicate balancing act to remain stable – not only economically, but also politically and socially. Russia’s Foreign Minister on Russia’s position on Ukraine. In the midst of ongoing turmoil that has enormous global significance, God is mightily at work in Ukraine, the nation’s acting president said Wednesday in an exclusive interview for Decision magazine. Dmytro Yarosh, leader of Right Sector, has been the least well-known figure over the past two months. Just two weeks ago, only a narrow circle of people involved with organizing the Euromaidan even knew about the very existence of the Sector and Yarosh. Today, it’s impossible not to describe events in Kyiv without mentioning Right Sector. An objective resource detailing the current Ukraine Crisis. Collection of resources maintained by the UCL School of Slavonic and East European Studies Library staff. G7 leaders’ position on actions to take towards Russia concerning Crimea and Ukraine.